HomeWho needs elected representatives? Not Cornwall! Who needs elected representatives? Not Cornwall! In 2008 Cornish communities were represented in local government by 331 councillors (excluding town and parish councils). In 2009, when a unitary authority was imposed, this was cut at a stroke to 123. Now, the Local Government Boundary Commission for England [sic] is proposing a further cull of Cornwall’s democratically elected representatives, to just 87. In 2008 Cornish communities were as well represented numerically as most English rural counties. If the Commission’s proposal goes through they will become among the least represented in the UK. Only nine local authorities, all big city, densely populated urban authorities, will have more residents per councillor than Cornwall. How has this amazing turnaround come about? The Boundary Commission’s proposal to cut the number to councillors by 36 stands out as exceptional. Currently, 16 unitary authorities (including Cornwall) are under review by the Commission. In seven of these no change is being recommended to their council size. The mean reduction of councillor numbers proposed overall is 6%. The proposed reduction for Cornwall is almost five times that – an eye watering 29%. Why is Cornwall being treated so differently than everywhere else? The Boundary Commission offers no convincing justification for this unparalleled cut in councillor numbers, one not previously experienced by any other top level local authority. Indeed, their report on Cornwall Council’s size (September 2017) is seriously flawed. Before reviewing the factors that might explain the push to de-democratise Cornwall’s communities we should briefly note the flaws in the Boundary Commission’s report. These are threefold. First, it is imprecise and based on assertions with no clear supporting evidence. Second, it is disingenuous in the way it presents the results of the consultation it carried out on council size. Third, it fails to put Cornwall in any wider context. It thus refuses to engage directly with the issue of parity or even admit that the reduction of democratic representation in Cornwall is unprecedented in the history of boundary reviews. It is difficult to escape the impression that the Commission had predetermined the council size and their report is merely a flimsy legitimation of a decision already made. 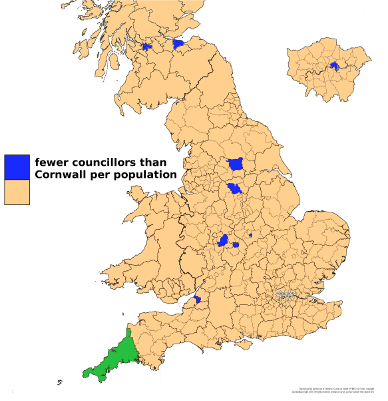 The Commission’s justification for its decision to opt for a 29% reduction in the size of Cornwall Council merely states that ‘the team considers that a council size will maintain an effective representational role for members, with particular consideration given to the geography, infrastructure and electorate distribution of Cornwall, The evidence suggests that a reduction in council size would be sustainable given the level of devolution to parish and town councils, and the implementation of new governance arrangements’. No explanation is provided for how or why Cornwall’s specific ‘geography, infrastructure and electorate distribution’ leads to its differential treatment. Indeed, its geography, infrastructure and electorate distribution is nowhere identified or compared with comparable authorities elsewhere. No evidence is presented to back up the assertion that this will be ‘sustainable’ and few details are offered concerning the devolution to parish and town councils or the revised ‘governance arrangements’. These will be dealt with further below, but this conclusion offers only a flimsy rationale for such an extraordinary reduction in councillor numbers. Cornwall Council’s alternative case for a council of 99 elected members is peremptorily dismissed with the airy generalisation that ‘the team do not consider that an effective case has been made to support a council size of 99’. Their reasons are left unexplained, other than 99 was outside the range of 85 to 95 proposed by the Cornwall Association of Local Councils. The Commission presents the results of its consultation in a vague and fundamentally disingenuous manner. It concentrates on those who ‘support a reduction’ rather than the number that favoured a reduction to 87 or fewer. Furthermore, by lumping together all 274 submissions the data are skewed towards submissions from private individuals, the only category that supports a reduction to 87 councillors. In fact, among local authority, political groups, MPs and elected councillors only the Conservative Party and its representatives were in support of a council size of 87. Every other submission from political groups supported at least 99 councillors. The disingenuity of the Commission’s presentation is best illustrated by its table in para 8 that classes former councillor Gary King’s well-argued proposal for a small reduction to 113 councillors as ‘support for a smaller council size alternative to 87 or 99’, while its position in the table below those supporting 87 is clearly meant to imply that this group also supported the Commission’s proposed 87. The Commission reports that ‘parish and town councils were split’. In fact 76% of parish and town councils disagreed with the proposal for 87 councillors and called for a higher number. Bizarrely, responding to Cornwall Council’s point that ‘the majority of local councils recommended a council size higher than 87’, the Commission states that ‘the team has seen no evidence to suggest this is the case’. They obviously didn’t look too far, as Cornwall Council provided detailed responses from parish and town councils in its submission. In addition, the results of the Commission’s own consultation clearly show that only 19% of town and parish councils favoured 87 councillors. The Commission reports that ‘local residents … largely supported a reduction to 87’. ‘Largely supported’ and similar implicit quantifications throughout its report ought to be avoided. In fact submissions from individuals broke down 60-40 in favour of the Commission. Moreover, at least eight of the 73 submissions supporting the Commission’s own position can be easily identified as active supporters, members or candidates of the Conservative Party. Clearly, apart from the submissions from Conservatives, most of those with a working knowledge of how local government actually works were opposed, many vehemently so, to the proposal for 87 councillors. Yet all these were effectively ignored by the Commission, intent on steamrollering its preference through, despite the evidence of its own consultation. Finally, the Commission fails to set its proposal in any kind of wider context. For example, it highlights some submissions but carefully chose not to include my almost 4,000 word comparison of Cornwall’s council size with other local authorities, even though it was the only submission to explore this issue in detail, based on up-to-date data. As a result, nowhere does it compare its treatment of Cornwall with other reviews, or compare the level of representation in Cornwall with other places. Therefore, the casual reader will have been left entirely unaware of the exceptional level of reduction it is proposing. It is significant that, in its summary of the Cornwall Council submission, the Commission fails to correct the assertion made by the Council that its proposed reduction of 19.5% was ‘comparable to other (recent) reviews’. This is not the case. The mean reduction proposed in current reviews of unitary authorities is 6%, not 19.5%. Even if we exclude the seven authorities with no change it’s still 15%. Cornwall Council’s own proposed cut was higher than the norm. The Boundary Commission fails to point out that its proposed 29% cut is far, far higher than the mean for other authorities. Nowhere does the Commission clarify that its proposal means that Cornish communities will be by far the least well represented communities in a rural authority anywhere in the UK in quantitative terms. Nowhere does it care to mention that only a handful of urban authorities will have more people per councillor. Furthermore, nowhere does the Commission make any reference to the Framework Convention for the Protection of National Minorities. (Articles 4, 15 and 16 would appear to be directly or indirectly relevant). Given the Commission’s flimsy justifications for a reduction in democratic representation for Cornish communities on this unprecedented scale and its refusal to answer the direct question of why it is treating Cornwall so differently from every other principal authority, we have to look elsewhere for the real reasons why Cornwall is being singled out for special treatment. How committed were Cornwall Council’s senior officers and leadership to maintaining councillor numbers at their current level? The Council adopted a very strange negotiating position. By proposing 99 councillors and a reduction of 19%, it effectively ceded the argument that a reduction in council size was necessary in the first place. Instead of sticking to a more robust position of no change and forcing the Boundary Commission to make a case for a cut in more detail, it moved well over halfway towards the Commission’s position. This allowed the Commission to confuse the issue by making it a choice between two cuts. It also undercut those who argued for maintaining parity of democratic representation with other similar local authorities. Why did the Council not make more of the Durham comparison? In 2012 the Boundary Commission review of County Durham’s Unitary Authority concluded that its 126 councillors were still required in order to provide ‘efficient and convenient local government’ and rejected local calls to reduce the Council’s size to 85 members. The Boundary Commission refuses to explain why in Cornwall it’s adopted the opposite stance, with a massive reduction in democratic input apparently being necessary for ‘effective’ governance. Cornwall Council also undermined its own argument by accepting the importance of a ‘fit’ between new ward boundaries and the Community Network Areas (CNAs). This allowed the Commission to argue that 87 provides the ‘best fit’. However, there is nothing at all sacrosanct about the boundaries of the 19 CNAs. These have no democratic role and were only created as convenient legitimation for the unitary authority in 2009. They have no historical basis. They have no cultural identities. There could as easily be 25 CNAs. Or just 10 CNAs. By fetishizing the CNAs Cornwall Council shot itself in the foot. Second, if the excessive importance given to CNAs is one strange aspect of this business, so is the stress placed by the Boundary Commission on the Cornwall Association of Local Councils (CALC). This body called for a council size of between 85 and 95 early in the consultation process. It would be interesting to know the precise political make-up of the CALC meeting that adopted this position. For the CALC appears to be entirely at variance with the councils it purports to represent, 73% of which did not agree with the proposed cut in their submissions on council size. Clearly, the Boundary Commission is grasping eagerly at the strawperson provided by the CALC. Just why so much credence is given to this unrepresentative body is unclear and again unexplained. Third, the Commission puts great faith in Cornwall Council’s ‘governance review’ of 2016. This will supposedly result in ‘new governance arrangements’ in 2021. Cornwall Council in March 2017 stated that it was devolving the management of over 300 public assets to parish and town councils (two thirds of these being public toilets.) However, this ‘double devolution’ has turned out to be another unfortunate accidental (or perhaps not) shot in the foot as, like the role of the CALC, the Commission seized on this to argue that fewer councillors are therefore needed at the Cornwall level. Yet, details of these new ‘governance arrangements’ are sketchy. In addition, there appears to be devolution to parish councils on the one hand, but an increasingly centralised strategic leadership on the other, both squeezing elected members out of any meaningful role. The Commission focuses on the former but passes silently over the latter. The plan is to retain a strong ‘Leader and Cabinet’ model. In addition, there is now a ‘Leadership Board for Cornwall’, but this body will have no direct democratic input. There is also a vague promise to develop more ‘open and honest relationships’. Is it really the case that these ‘governance arrangements’ are so spectacularly innovative as to warrant such an extraordinary cut in the democratic component of the Council? Is no other council in the UK doing anything similar? It would appear they are. Cornwall Council, in its latest update, states that ‘similar frameworks are being adopted by other councils across the UK’. If so, then why are those councils not facing similar cuts in their sizes? Moreover, if double devolution really means the devolution of power and decision-making, let alone finances, to parish and town councils then why does the vast majority of parish and town councils remain sceptical and unconvinced by the promised new arrangements? None of this looks sufficient to justify the exceptional nature of the cut in the number of elected voices at Cornwall Council. On the contrary the ‘double exclusion’ of elected members might be seen as an argument to strengthen the democratic component of the Council rather than weaken it. So we must turn to a final, less transparent, factor that needs to be factored in. Did Cornwall’s so-called ‘devolution deal’ of 2015 include an explicit or implicit agreement on the part of Cornwall Council to accept a reduction in councillor numbers? Did it also contain an overt or implied instruction to the Boundary Commission to proceed with its extreme plan for Cornwall? This might explain both the Commission’s determination to press ahead with reducing councillor numbers in the face of the evidence of its own consultation and the Council’s rapid caving in and offer to reduce councillor numbers by 19%. There is nothing explicit that can be found in the Government’s official release about Cornwall’s devolution deal that suggests a reduction in councillor numbers on the scale being proposed by the Boundary Commission. Nonetheless, the Commission reports that Cornwall Council’s Conservative Group believed that ‘it was intended as a result of this deal for councillor numbers to be “much reduced”’. Was it? And did Cornwall Council’s leadership knowingly sign up to this agreement? The devolution deal and the mysterious ‘agreements’ that did or did not accompany it may be the smoking gun that explains this serious erosion of the democratic rights of Cornwall’s communities. If this is so, then Cornwall is being treated even more unfairly than it first appears. For, in all the other devolution deals, mainly urban areas plus Cambridgeshire, the ‘devolution deal’ requires the establishment of a new layer of government. Part of this is unelected in the shape of Combined Authorities, with representatives from existing local authorities, and part is a directly elected mayor. Cornwall is the only region not to receive an extra level of democratically elected government. It might therefore be expected that, given the addition of a further layer of democracy in elected mayors, local government authorities in those other regions with devolution deals would be suffering an even greater reduction in their size to compensate. Not so. In fact, quite the opposite. While Cornwall’s elected representatives are being culled by 29% with no additional level of democracy put in place, first-tier local authorities in the other areas with devolution deals and elected mayors and undergoing current reviews are seeing only a mean 7% cut in councillor numbers. While the number of councillors in the two district councils in Cambridgeshire under review are being cut, the cuts are 21% and 28%. (Cambridgeshire County Council is also being cut by 12%). So even the cuts at district level are still below the proposed level for Cornwall. Cornwall is being treated even worse in this respect than lower-tier local authorities in areas which have comparable devolution deals. This discriminatory treatment of Cornwall’s democratic rights has no parallel, either with comparable unitary authorities such as Durham, or with regions with devolution deals. Behind the scenes pressure from the Conservative Government after Cornwall’s devolution deal appears to explain the Boundary Commission’s determination to impose this anomalous cut in Cornwall’s elected representatives. When we consider this together with other recent developments, such as the Planning Peer Report of January 2016 and attempts to instil a ‘positive Council culture’ among councillors (meaning replacing loyalty to their electors with loyalty to the Council), or Cornwall Council’s plans to become a housing developer in order to meet its ‘target’ for unsustainable housing and population growth, the cut in councillor numbers begins to make more sense. This unprecedented cull has to be viewed as part of a bigger project to make the local state in Cornwall more efficient by further eroding the existing limited role of elected members in its governance. It’s hardly a coincidence that such an agenda will have the effect of neutering potential future opposition to the state’s plans for Cornwall. These involve the continuation of a hyper-growth agenda that depends on relatively high in-migration, while reserving selected parts of the territory as playgrounds and gentrified environments suitable for the holiday ‘industry’ and the second ‘home’ market. The fundamental drive lying behind the ongoing attacks on what remains of Cornwall’s democracy is to ensure any community resistance to the state’s colonial project is finally quashed once and for all.